We spent the afternoon at the park, blowing some bubbles and spilling the rest, while enjoying the warm summer breeze. When we came back to our room, the hospital dinner had been left on Tehilla's bed. She looked at it, and in her best teenager impression, rolled her eyes and said, "Not again! I don't like this. It's not good." I tried not to laugh, but she really wasn't wrong. So we went to go get some pasta and salad for dinner. She was much happier. I asked that Tehilla be given some pain medication and antihistamine before bed again, that way she might have a decent night. We were surprised by our blog friend Sara Gita who brought Tehilla a Hello Kitty white board. That was a lot of fun and Tehilla had a great time drawing with her. Tehilla is now sleeping but seems unsettled. Her oxygen saturation dropped before but has now gone back and her heart rate is once again low. Yesterday night, after the incident with Tehilla's heart rate, the nurse and I were talking next to Tehilla while she was sleeping. The nurse asked if it was okay to hook her up to the blood pressure cuff for the night, to monitor her because of her heart rate. I said yes and thought it was a good idea. In her "sleep", Tehilla started doing that Israeli kid shoulder shrug which translates to "I don't wanna". We thought it was funny at the time, but today my cardiac nurse explained that Tehilla did that because she is not allowing herself to fully sleep. She is staying on alert because of the trauma she has experienced. 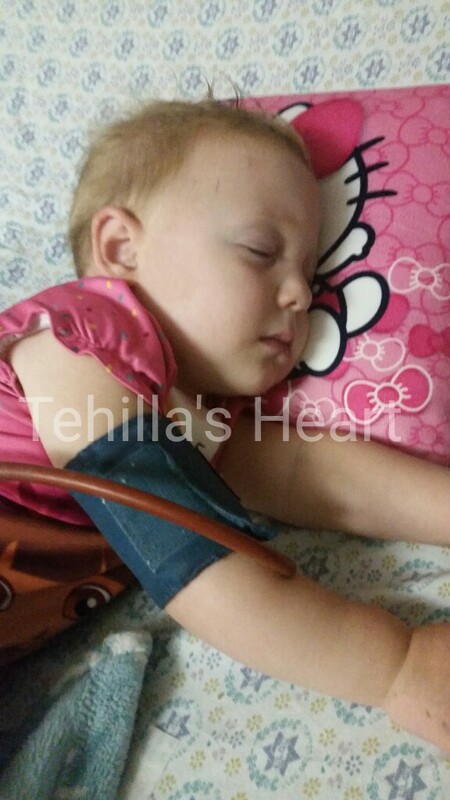 Overall, Tehilla is doing well. Infrequently I find Tehilla retreating into herself. For the most part, she is talking and in high spirits. Every now and then, something sets her off and she won't talk for awhile. She doesn't scream when doctors come to her room anymore but she cries if they try to touch her. She has warmed to a few nurses. Once we get Tehilla home, she should be able to slowly put a lot of this behind her and we will help her with it. Here's to hoping for a sweet, quiet and uneventful night! She is clever, she knows what she wAnts, hehe.